Dense transition metal borides are a new class of the growing family of superhard materials. These compounds may find use as cutting tools and protective coatings. In the study published in Physical Review B, CDAC Partner Abby Kavner, CDAC student Matt Armentrout, and collaborators from UCLA examined the high pressure behavior of a new superhard material candidate tungsten tetraboride (WB4) in a diamond anvil cell up to 58.4 GPa. The zero-pressure bulk modulus, K0, obtained from fitting the pressure-volume data using the second-order Birch-Murnaghan equation of state is 326 ± 3 GPa. 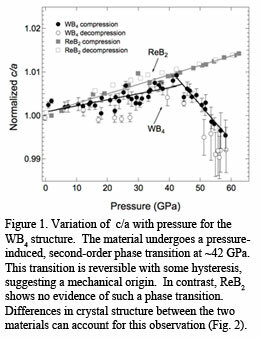 In contrast to the high pressure behavior of superhard ReB2, an anomalous lattice softening of the c-axis in WB4 during compression takes place, which is partially reversible during decompression (Fig. 1). The anomaly is assigned to a second-order phase transition. 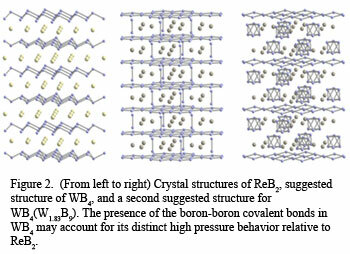 It is proposed that the three-dimensional, almost isotropic, covalently bonded boron network in WB4 is responsible for both the observed structural change in WB4 and its high intrinsic hardness. In addition, based on the measured bulk modulus and an estimated Poisson’s ratio, a high shear modulus of 249 GPa iss estimated for WB4 using an isotropic model [M. Xie, Phys. Rev. B 85, 064118 (2012)].